Deuteronomy is book 5 of the Pentateuch. It is the farewell letter of a dying prophet (Moses) to the nation he loved with all his heart, mind and soul (*there are 51 references to “heart” in the book). The book was written to the Israelites beyond the Jordan – when they were in the wilderness. Deuteronomy means “second law,” Moses “re-tells” the law because as you may recall, the Israelites broke it the first time (the Golden Calf incident is often referred to as “the Second Fall”). Today Moses is the author, and he puts forth a 2nd law to the people. Telling them again – follow God’s law! Do as you are commanded. Do not veer from this law but take it into your homes and hearts. What we have here is, in effect, “Part I” of God’s law – Part I lives in the Old Testament writings. What then is “Part II?” Part II of course is the New Covenant that is ushered in by Jesus. That New Covenant is activated the moment Jesus dies on the cross, the moment he has given his life – his body – for us as expiation for our sins. So think of Reading 1 as a precursor. God (through Moses) establishes the law. Jesus does not abolish it, but fulfills it. Psalm 15:The one who does justice will live in the presence of the Lord. Note the mention of “heart” in the first verse. Aim this week to do justice for God in your daily life by aiming to be a follower of Him. We have a special treat today, hearing from St. James. He was concerned largely with ethical conduct, and today we hear his point of view on living out the Word we read. Understanding – or working hard to understand – that the Word is ALIVE. That Christ actually IS the word of God, the scriptures, but just in the flesh. That is why this blog exists. To crack open The Word, to open the scriptures, so that we better understand Jesus, for He IS the Word. Today, we must be Doers. We must act as we believe. that we may be a kind of first-fruits of his creatures. It’s important to know as you hear the Gospel that the Pharisees were hyper. They were hyper-careful and hyper-vigilant about keeping the laws of their forefathers. Imagine you had something valuable you didn’t want anyone to to take. A diamond ring for example. You put it in the lock box of a bank to keep it safe. Then you put that lock box into another safety-deposit box to keep the ring even safer. The ring is surrounded by 2 circles of safety – the lock box, and then the safety deposit box. This is what the Pharisees did with God’s law that was handed down by Moses. They said, “We will not break God’s laws again! And to be sure of that, we will make even MORE laws (the outer-most ‘circle’ of safety) so that the mosaic laws (the inner-most ‘circle’ of safety). But that outer-most circle were laws the Pharisees concocted, not God. What eventually happened is that the Pharisees become so fixed on not breaking any laws that the lost what was at the heart of the matter – following God, and giving him quite literally, your heart. We are called to generosity of heart. 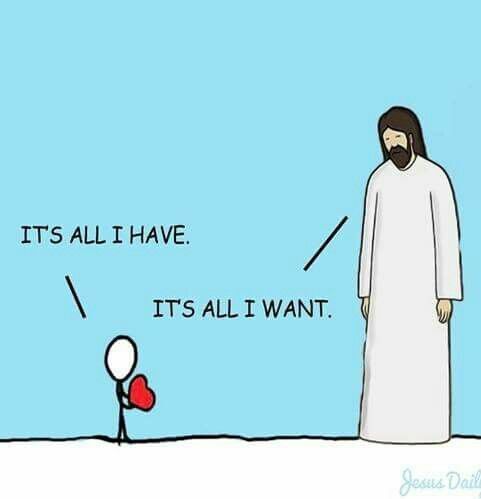 God wants our hearts entirely. Fully. Unabashedly. Today we are reminded not to get so caught up by all the rules that we forget the One who set them in place for us and the end goal of becoming His follower. We are called to follow Him throughout our lives and be led by His great hand to the promise land of Heaven.